U.S.-Belgium Match Could Be A Game Of Goalkeepers : The Two-Way Having escaped the "Group of Death," the Americans are poised for their first game in the knockout stage of the World Cup. The victor heads to the quarterfinals. U.S. goalkeeper Tim Howard pumps his fist after qualifying for the next World Cup round following the team's 1-0 loss to Germany last week. Win or go home. Do or die. Lose and you're done. Choose your sports cliche, and for the United States team, it's true. The U.S. takes on Belgium at 4 p.m. EDT today in Salvador, Brazil. It's the Americans' first game in the knockout stage. The victor moves on to the quarterfinals, and the loser books a flight home. The scrappy U.S. team made it out of the "Group of Death" by beating World Cup nemesis Ghana, tying a tough Portugal team and losing to world No. 2-ranked Germany. Belgium, by contrast, had a far easier schedule in round-robin play. Belgium won all three of its games, though its opponents consisted of Algeria, Russia and South Korea. None of that will matter when both teams take the field in this seaside Brazilian city. The U.S. got a bit of good news Monday when it was announced that striker Jozy Altidore, who went down early in the first game against Ghana with a hamstring injury, has been cleared to play. His injury has scrambled the U.S. lineup. If he returns to the lineup and is healthy, it could give the Americans a needed jolt to kick-start the offense. This may be a game of goalkeepers. American Tim Howard has largely shined this World Cup. Belgium's Thibaut Courtois is hailed as one of world's best — he's given up only one goal in three games so far in the tournament. One area where the U.S. will not need help is its fan base. Tens of thousands of Americans are here in Salvador. No matter where you are, you can't miss the red, white and blue. In each of the past three U.S. games, American fans have consistently been the loudest, bellowing "U-S-A, U-S-A, U-S-A!" and "I believe that we will win! I believe that we will win!" It echoes across each stadium, and the players hear it. At the team press conference Monday, U.S. coach Jurgen Klinsmann said it means a lot to hear the excitement up in the stands. "Packed stadiums. Enthusiastic crowd. And the energy is there," he said. "So we want to do extra well for all those fans. Because it's a cool moment right now, so we want to continue that." "Is it a good feeling? No. Because he's coming from the same group with Belgium, Algeria," the U.S. coach said. "He's able to speak French with their players on the field, not with us. And it's the country that we beat in the last second at the last World Cup." As Tom reported, having your country's head coach grouse about the refs a full day before a match may be the best indication yet that American soccer has arrived on the global stage. It's game day. Will the U.S. be flying home later today or moving on to Brasilia to play in the quarterfinals? 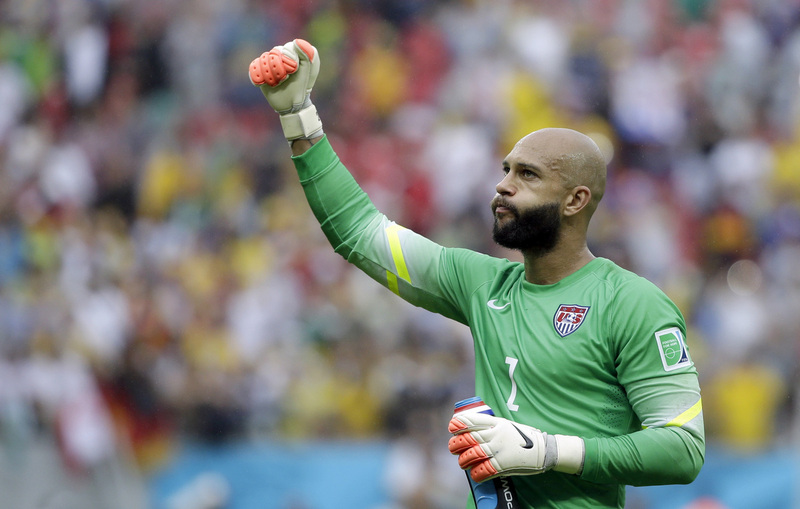 We'll be live-blogging the U.S.-Belgium game here at The Two-Way. You can watch coverage on ESPN starting at 3 p.m. EDT. Univision is also streaming the games live on its website.